For a series that critics claim is complacent, Mario Kart 7 introduced plenty of new mechanics such as underwater and aerial racing as well as kart customization. The sixteen new tracks are some of the best the series has ever seen with multiple shortcuts, places to nail tricks off of, and hazardous turns to drift through. For some reason the American and European versions have differing names for a good share of the tracks. For the most part, the European version has better names such as Koopa City instead of Neo Bowser City, Melody Motorway instead of Music Park, and Piranha Plant Pipeway instead of Piranha Plant Slide. 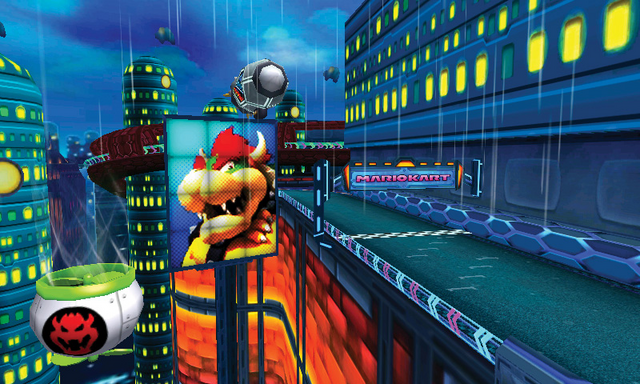 In a race, Neo Bowser City (or Koopa City in European areas) would be eating the dust of its competitors. 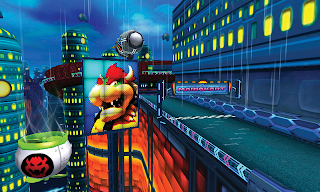 The name gives away that the track takes place in a futuristic city run by the king of the Koopas that is filled with winding turns and neon-lit signs. The track itself is pretty featureless. Rain falls on the roads, creating puddles that if a kart runs over will spin an unfortunate soul out. The final stretch of tracks enables racers to fly through the air off of the last hill that leads to the finish line. 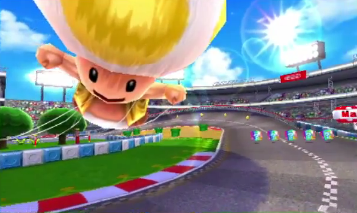 Not even the remix of Toad's Turnpike (Mario Kart 64) can make this track very interesting to me. 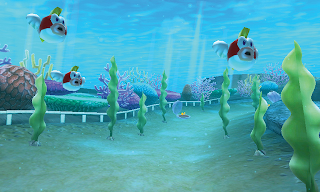 From the starting line, racers make a 90 degree turn towards a dock that abruptly ends, plummeting players into the titular lagoon, full of Cheep Cheeps, seaweed, and clams that open and close on a routine basis. A well-timed drive through an open clam shell can grant a racer coins or even an item box. The underwater section has multiple hills, allowing racers to trick off them for extra boosts of speed. The final stretch grants the ability to either ride along a narrow path followed by a small flight in the air (just watch out for the cavern's stalactites), or an underwater Sunday drive (here you must watch out for crabs). An oceanic ride, Cheep Cheep Lagoon is fifteenth on this list. 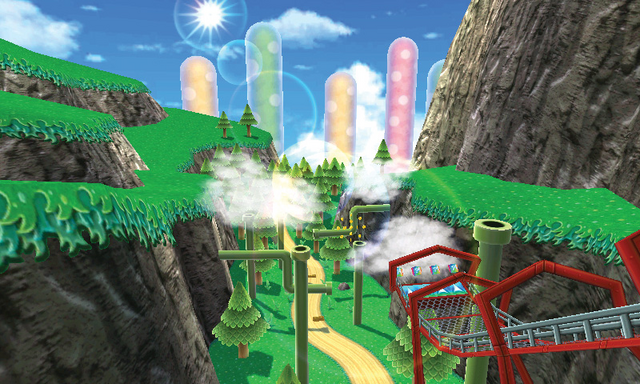 The skies are a bright blue with three giant inflatable Toads in the air: red, blue, and yellow in Toad Circuit. 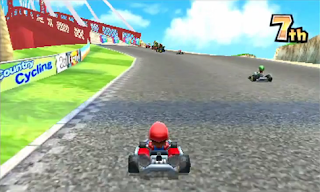 The track is the first in the game, so it's simplistic in nature. It is almost a figure eight with some slight variations. Players can catch air off a ramp to fly over an overpass or choose to drive under the bridge. A tunnel then takes racers to the back stretch where one can practice their drifting or opt to use a Mushroom to bypass a big turn to save some precious time. Toad Circuit is a pleasant introduction to the dog-eat-dog world of Mario Kart 7 which is why it speeds into the fourteenth spot. Most tracks are three laps, but Wuhu Loop shuns this structure. Instead, it utilizes a start and endpoint structure. It has three sections that takes players around the base of Wuhu Island from the starting town, across the red suspension bridge, along the cliff side of the island, through the plains, and back to the town. Watching out for cars is a given, but in case you don't consider them threats, watch out for cars. Wuhu Island was first introduced in Wii Sports Resort (of which it uses a remixed theme for the track), and then made its return in the Nintendo 3DS launch title, Pilotwings Resort. A summer-themed drive through the easy going curves of Wuhu Island is just what a kart racer needs to loosen the nerves and gain some peace with nature. This course is split into two parts: a drive through a Piranha Plant- and Goomba-infested sewer and an outside grassy plain full of trees, Goombas, and bushes that are heavily reminiscent of the original Super Mario Bros., only in 3D. Even the clouds are the same shape as the bushes! What starts with a ride down a water slide ends up in a dank and dark series of turns. A giant Piranha Plant sits in a pipe in the fork of the road. Of course, you can try to take the middle path for some extra coins, but the carnivorous plant makes for an obstacle. After this, a series of turns full of the underground-colored Goombas from World 1-2 of SMB lurk, ready to spin players out. Then comes some rail-less turns with some pipes allowing players to trick off them. 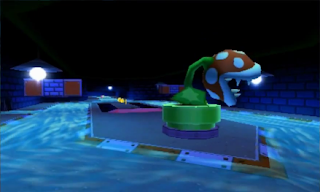 An underwater section leads to a jump that sends racers taking flight, avoiding three pipes spewing water, and reaching the outside, final section of Piranha Plant Slide. Own the mountain. You begin on the cliff side of the mountain with a huge pit alongside you to the left. The road is curvy and leads to a cave inside the mountain where Swoopers-- bat creatures-- flying in your path to slow you down and rock-solid columns throughout the cavern. The exit of the cave leads to a downhill path followed by a ramp that opens your glider. You're in free flight now, but be careful to avoid the horizontal pipes that rest in the way. A forested section is followed by a huge uphill section where big boulders threaten to flatten those unprepared. Reaching the top of the path once again opens your glider, allowing you to casually fly over the finish line if you so choose. Rock Rock Mountain is a fun ride full of fun obstacles and great gliding opportunities. Remember Subcon from Super Mario Bros. 2/Super Mario USA? 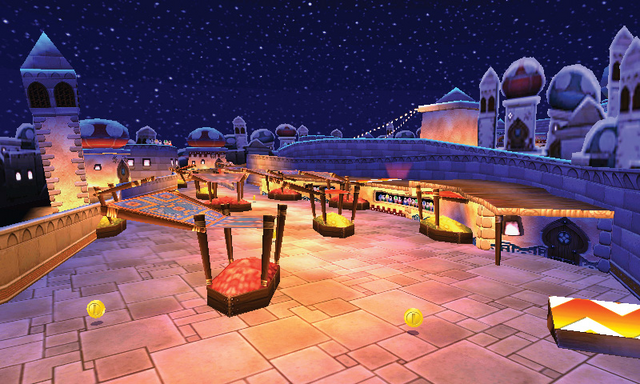 If so, you will get fond flashbacks of the dream world as Shy Guy Bazaar is a veritable reintroduction. In fact, the final section of track has players gliding across a dark pit while dodging Shy Guys who soar in the air upon flying carpets. The actual bazaar area of Shy Guy Bazaar allows players to drive through the Arabian-themed streets and vendors or take it to the top and ride along the roofs. Even the pots can be obstacles, running into one reveals either a Mushroom, Banana, Green Shell, or if you're very lucky, a Star. The brick road barely dusted by sand wraps its way through this excellent track, giving players constant opportunities for divine drifting and other splendid racing feats. Right off the bat on the snowy and icy track you can see Rosalina's Comet Observatory on the right side of the starting line. As if that wasn't exhilarating enough, you will then speed through a halfpipe-esque area where the right side houses a time-costing pit. A cavern comes and ends with a short ramp that you can either jump onto a series of icebergs (first lap only) or dive underwater to gather coins. 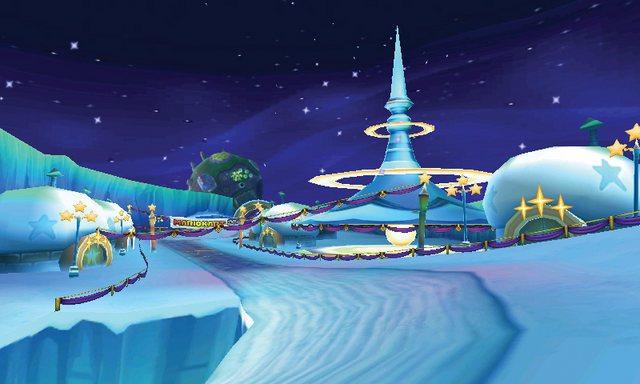 Penguins from Super Mario 64 call this area of Rosalina's Ice World home. After exiting the icy depths, you enter a cavern full of icicles that will slow down any who crash into them. From there you have a choice of two paths: an easy path or a more challenging and rail-free path full of boosters. A final jump and a final turn reintroduces players to the beginning of the track. This track oozes with Super Mario Galaxy charm, making it number nine on my list. A waterlogged course which reminds me heavily of Wario Land: Super Mario Land 3, Wario Shipyard (or Wario's Galleon) is home to the yellow and purple-clad plumber and rival to Mario. 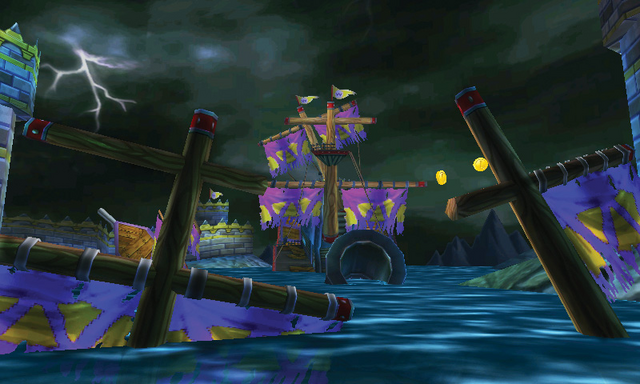 Hazards includes swinging anchors, topsails while gliding, sidestepping crabs, broken remains of the galleon, and jet streams which threaten to push players off of the track completely. The track is heavily atmospheric, dark, and gloomy, perfect for Wario's personality, which makes me enjoy Wario Shipyard a lot. From sharp turns to being able to glide while dodging topsails and anchors, the track has no shortage of entertaining ideas. Keys that can be driven over, making different sounds as they are pressed, glockenspiels and xylophone paths, drums that bounce players across chasms, and notes that leap into the air that can either smash players or allow them to trick as they hop in the air are but some of the fascinating ideas used in Music Park (known as Melody Motorway, a superior name, in European countries). There's even vegetation in the form of grass and gigantic Piranha Plants that will bite players if they drive within the light surrounding them to be enjoyed. Music Park is a colorful, enjoyable, and thrilling track that challenges players to keep their wits with them if they want to earn that checkered flag. Regardless of it having a huge glitch allowing for cheaters to skip half the track, I am judging Maka Wuhu by its merits as a cleverly constructed track and nothing more. Like its Wuhu cousin, Maka Wuhu has three sections and forgoes the three lap structure. One section begins at the base/beach of the island, racing through mud and dirt paths which constantly fork. All this leads to a cavern full of pits that players can fall into. Leaving the cave leads to the island's castle which the track loops around. This opens up a path still heading up the mountain with players narrowly avoiding boulders that roll down the opposite way. At the peak of the mountain players drive off a ramp, open their gliders and float down to either a floating target or Wuhu Island hotel's roof before once again taking a ramp to glide down to the beach which houses the finish line. I love using the shortcut that enables players to drive through a purple pool of water in front of the island's castle, riding up the path, going through the castle, and cutting a good amount of seconds off one's time. It also helps that I'm a sucker for a beautiful sunset. Based upon Retro Studios' Donkey Kong Country Returns-- in fact, Retro Studios helped to design some of the courses of Mario Kart 7-- the first track of the Special Cup, DK Jungle, is like driving through a level of Returns. Even the oh-so-familiar Jungle Hijinks theme plays as you race through jungles full of Tiki Goons, Screaming Pillars that push gliding karts back and forth, and swamp frogs that will spin unfortunate racers out. 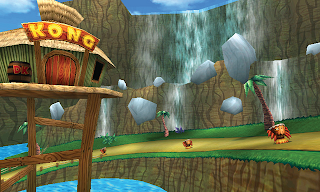 During the section with the trio of Tiki Goons, one can plainly see DK's home sitting on stilts to the left of the curved path. The final portion of track has racers running up sloped paths up to the Golden Temple where the fabled golden banana rests. A last glide past Screaming Pillars and a choice between two curved paths gives way to the finish line. My nostalgia for Donkey Kong knows no bounds, making this jungle jape number five on the list. 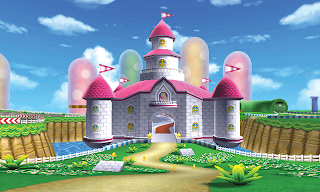 Even though it is only the second track in Mario Kart 7, Daisy Hills is a wonderful track in my mind. It harks to a Dutch landscape as it has a vibrant village surrounding the starting line, full of windmills and hot air balloons soaring in the bright blue sky above the track. 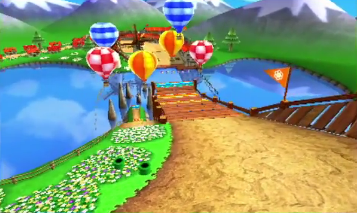 In fact, the windmill blades and balloons become hazards as you fly through the sole flying section of the track. As for the first portion of the track, there's plenty to take in here as well. You're constantly going uphill, bypassing verdant fields of flowers and grass, using logs as a means to trick off of and goats that block the road at certain sections of track. Daisy Hills may be an early introduction to flight in Mario Kart 7, but is one of the more impressive rides in the game. I like this version of Mario Circuit for its simplicity. It's a gorgeous track with grassy fields, smooth, paved, cement roads (sometimes sandy paths), and lovely cherry blossom trees surrounding the curvaceous nature of the course. The petals fall on the road as you drive by. 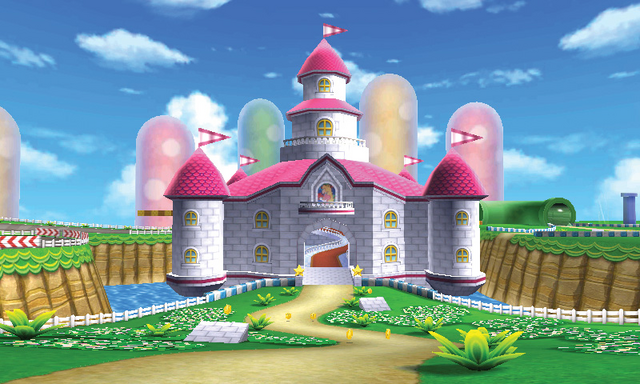 My favorite part of Mario Circuit is when you careen off a ramp, bounce off a red mushroom trampoline, make the trip towards Peach's Castle, and drive up the red-carpeted spiral road inside Her Majesty's home. What follows is another ramp that has players opening their gliders, flying over pipes that blast out hot air, perfect for catching even more air, before curving into a warp pipe tunnel that leads to the finish line for the next lap. The track is quaint, delightful, and a feast for the eyes. I normally enjoy Mario Circuit tracks in Mario Kart games, and this version is no different. 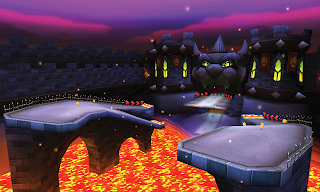 If there is a constant in Mario Kart, it is that the Bowser's Castle tracks are one of the better courses in each installment. 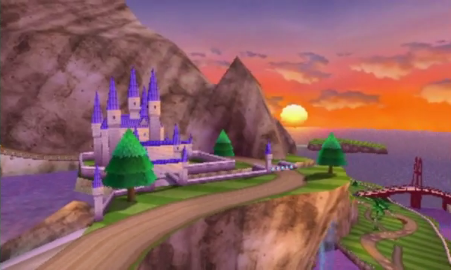 That tradition continues with Mario Kart 7's iteration of Bowser's Castle. Beginning with a ramp to glide straight into either the top floor or bottom floor of the castle. Either entrance leads to the same place. What follows is a series of hallways full of crushing Thwomps and later a pool of lava under a quick shortcut. Whichever way one chooses gets players by a rotating wooden wheel that after it concludes leads players into an underwater portion of track, full of lava geysers and pools of the hot-to-touch substance. Exiting the water grants racers access to a mountain path full of dangerous curves all culminating in a glide to the finish line. This is one of the only courses where you are supposed to fly over the line. In fact, you're supposed to soar through a big ring that signals the end of the track. 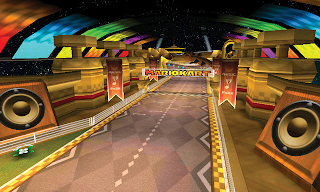 The ultimate track in Mario Kart 7 and the final Special Cup track, Rainbow Road keeps the trend of extravagant track designs for the series of courses going strong. 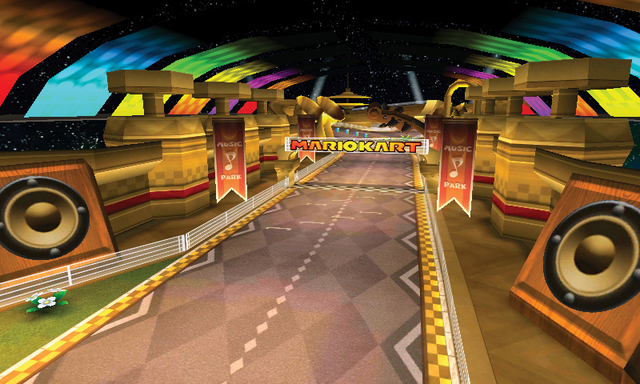 Like Wuhu Loop and Maka Wuhu, Rainbow Road uses the three section structure. 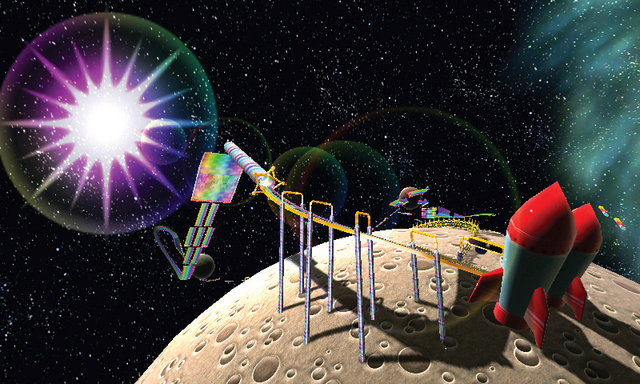 From racing around whole planets to driving on the face of a low gravity, Chomp-covered moon, Rainbow Road is a wild ride. The majority of the track has no rails, so falling off is especially easy to do. The final part of the course is by far my favorite as it allows players to glide through star gates a la Super Mario Galaxy, speeding through the air instead of dealing with the hazardous, gap-filled track below. The last incredibly dangerous turn can make or break a race for a given player. Make sure your nerves are calm, your drifting is true, and you driving skills are top of the line. Mario Kart 7's Rainbow Road takes you through an epic intergalactic adventure through the boundaries of space all within the time span of three minutes. What a workout for the fingers that was! 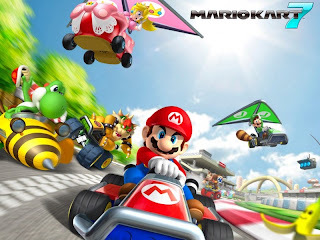 What are your favorite Mario Kart 7 tracks? Let the SuperPhillip Central community know in the comments section.